Created by one of Marbella´s star architects this modern designer villa is situated in Nagüeles, one of the most exclusive communities on the Golden Mile. The first impression is of a sleek modern Mediterranean villa, while the treatment of the interior distribution also reveals a Northern European inspiration. Natural light flows in throughout the house thanks to elegantly styled and positioned windows that offer a great variety of perspectives of the garden, sea and La Concha Mountain. They add a sense of Zen serenity to the bathrooms, inspiring vistas in the bedrooms and bring lovely greenery into the home’s living spaces, but before you experience this you will have enjoyed a very pleasant entry into a private domain that adds to its stylistic credentials. An automatic gate opens to allow access to a parking area for three cars, while the main forecourt – which leads to another two covered parking spaces – is beautified with water features, elegant lighting and landscaped elements. A two-tiered cascade serves as visual inspiration not only at the point of arrival, but also adds lustre to the lounge area, which further overlooks the garden, pool and covered terrace that runs along the south-side of the property. 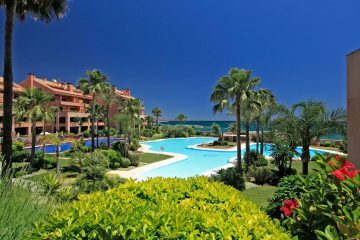 It is in the open yet angled layout of the living room, the separate dining room and luxurious kitchen with state of the art appliances that the Northern European influence comes to the fore, though look out to the lush green garden, clear blue skies and swimming pool sparkling in the Andalusian sun and you immediately know you’re in Marbella. The refined kitchen features a luxurious lacquered finish and minimalist design style but also stands out for the quality of its laundry, which has its own independent access, and the large modern glass vinoteque that beautifully blends form and functionality. Stairs lead up to the first floor, where the master suite includes a luxuriously fitted out bathroom, a made-to-measure dressing room and a private terrace that takes in the panoramic sea views. The other three bedroom suites can also be converted into two suites, but it is the rooftop terrace that adds the ultimate lifestyle element and unique touch to this home, which also features marble floors and underfloor heating throughout. Large and private, it offers space for a dining area, a lounging area and your own cocktail bar. Making the most of a setting full of personality and charm, this villa combines modern aesthetics, layout and lifestyle – as well as great value – in a prime Golden Mile location. 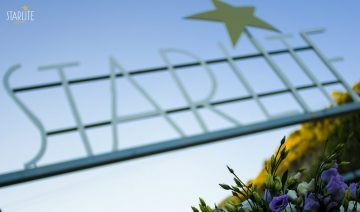 Starlite Festival – One of the greatest events in Marbella !